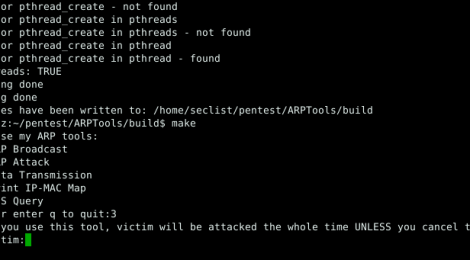 Browse: Home / ARPTools – A simple tool about ARP broadcast, ARP attack and data transmission. ARPTools Now it accomplished the basic requirement, includes ARP broadcast, ARP attack, data transmission and DNS query. But the speed of data transmission is slow and I still can not solve this problem. You have to run this program by root. + Arp Broadcast; It allows you to broadcast ARP request and find other machines in the LAN. Now you can create a file named “im.config” to modify your settings in the same directory with the program. + Arp Attack; It allows you to select a victim and make him or her can not connect to the Internet, and you can enter ENTER key to stop the attack. this option, the attack will not stop UNLESS you cancel the program. + DNS Query; it can work for querying a domain name’s IPv4 address, IPv6 address and CNAME. Enter 5 at menu, and enter the domain name, you can get the answer later. ← S3BucketLeaks – External audit of Amazon S3 Bucket configuration to prevent data breach (offensive side).